Building upon an extensive set of U.S. and international community planning workshops and reports, the Ocean Carbon and Climate Change (OCCC) program was designed as an ocean component of the U.S. Carbon Cycle Science Program. The OCCC program is integrated into the Ocean Carbon and Biogeochemistry Program (OCB), which focuses on the ocean’s role as a component of the global Earth system, bringing together research in geochemistry, ocean physics, and ecology that inform on and advance our understanding of ocean biogeochemistry. The overall program goals are to promote, plan, and coordinate collaborative, multidisciplinary research opportunities within the U.S. research community and with international partners. Ocean Carbon and Climate Change: An Implementation Strategy for U.S. Ocean Carbon Research (Doney et al., 2004) provides the scientific rationale for a coordinated ocean surface and space observations, experimental study, numerical modeling, and data assimilation effort for the coastal ocean, ocean basins and atmospheric components of the carbon cycle over North America and adjacent coastal ocean and ocean basins. 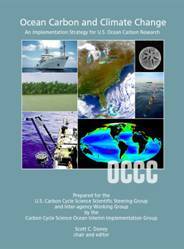 The report presents an integrated multi-agency, interdisciplinary science and implementation strategy for oceanic monitoring and research aimed at determining how much carbon dioxide is actively absorbed by the coastal ocean waters and how climate change will affect the future behavior of this carbon reservoir. The strategy consists of several coordinated and integrated elements on global ocean carbon observing networks, multidisciplinary process studies, data fusion and integration, synthesis and numerical modeling, and new technological development. While the program encompasses a wide breadth of ocean biology, chemistry, and physical research, the program promotes linkages and interactions with related ongoing oceanographic, climatic, and carbon cycle programs to address the full range of scientific elements relevant to marine carbon dynamics and the climate change (e.g., SOLAS, IMBER, CLIVAR, GLOBEC, GCP, and others). The Ocean Carbon and Biogeochemisty Scientific Steering Committee (OCB SSC) provides critical leadership to the OCB community by helping to identify research priorities and promote, plan, and coordinate collaborative, multidisciplinary research opportunities in ocean biogeochemistry. See the OCB SSC Charge and Terms of Reference.